Pavements. Sidewalks. Whatever. We take them for granted, bemoaning uneven surfaces, narrowness, crowding, sneaky dropped curbs, rapid successions of junctions where all we can do is wait to hesitantly cross. Secretly, though, they’re the great unsung hero of many a runner. 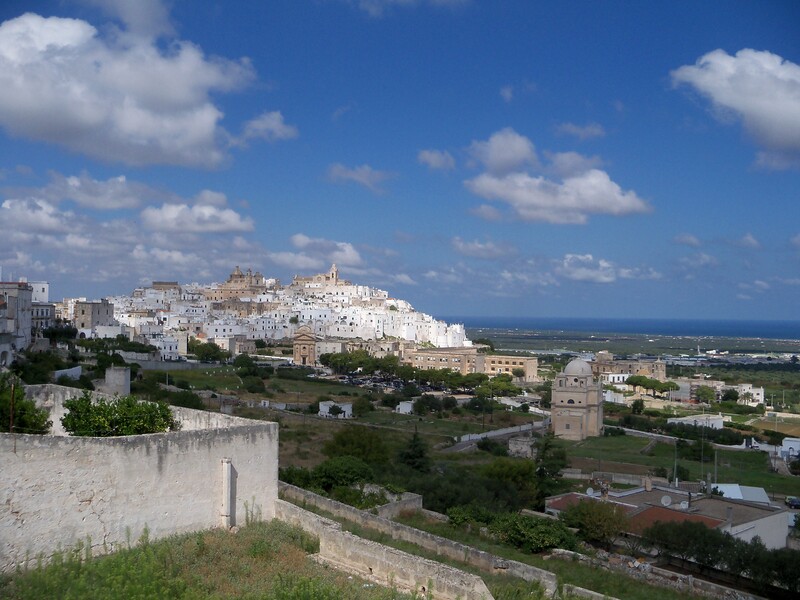 We spent the last week in a small city in the south of Italy – Ostuni – four or five miles from the coast, best known for its white-washed labyrinthine mediaeval heart. Slightly out of season, the too-hot baking heat of August had made way for a pleasant warmth (fiery hot in the sun, very nice in the shade) and a cooling wind to take the edges off the midday scorch. Perfect weather for exploring, and pretty manageable conditions for running. Normally I’d scout round a new city looking for promising running routes, as I did here. The historic centre is largely traffic-free, but cobbled, full of steps and cafes spilling out into plazas and tourist groups sauntering leisurely through narrow alleys. Not ideal. The main town is small, tight-packed, and a combination of narrow pavements, cobbled, stepped residential streets and – here we are at last – streets with no pavements. I made it to the sea, peered at the small harbour in Villa Nova, and decided to head straight back so that I wasn’t gone too long. The sun vanished behind a cloud and the descent turned to ascent, all the while with the peaks of Ostuni in the skyline above. I managed a decent pace, but all the while – as with the out-bound run – very aware of the road and traffic. What should have been an enjoyable run became something more functional, rather than the kind of exploratory recce that usually yeilds little-known restaurants, spectacular viewpoints and interesting buildings for more pedestrian tourist activities. A couple of days later, having had no bright ideas about alternative running routes, I decided to set off in the opposite direction. Again, I was soon out of pavement an on one of the large Strada Provincales that join towns and cities together. I turned off to head towards a church spire, which turned out to be a monastery (for a country where you have to cover up to visit churches, I’m not sure how well turning up at a monastery in shorts and a vest goes down). Defeated, I headed back to top off the run with a few lengths of the smooth traffic-free walk under the mediaeval city’s walls. So now, back in (a considerably cooler) Britain, I’m going to fully appreciate the network of paths, pavements and tracks that I routinely begrudge. Sure, there are some busy junctions on my run into work as I cross at Euston. Maybe the paths of the Lee Valley are a little uneven. But it’s safe to run, and I’m not confined to a tiny loop, so I’m going to fully appreciate just how easy it is to run where I live. I had the very same experience running in Greece on holiday this year, so I know what you mean about the pavements in the UK.